Congratulations on the newest addition to your family! Whether you’re a first time mom or a seasoned veteran, having a new baby can be a challenging time. Exercising may or may not be on the forefront of your mind; however it’s really great for both you and baby. Most everyone knows the benefits of exercise, but did you know that regular exercise after having a baby can help to decrease stress levels, increase your energy and help you sleep better? Not to mention improve your overall fitness and help get you back into those skinny jeans! As a new mom it’s easy to find excuses not to exercise - you don’t want to spend on a costly gym membership, you don’t want to take time away from your little one or you don’t want to leave your baby at a daycare. The great thing about the exercises below is that they can all be performed in and around the comfort of your own home, on your own timeline! The American Congress of Obstetricians and Gynecologists recommends 150 minutes of moderate intensity exercise weekly. Aim to start slowly, as soon as you feel up to it. 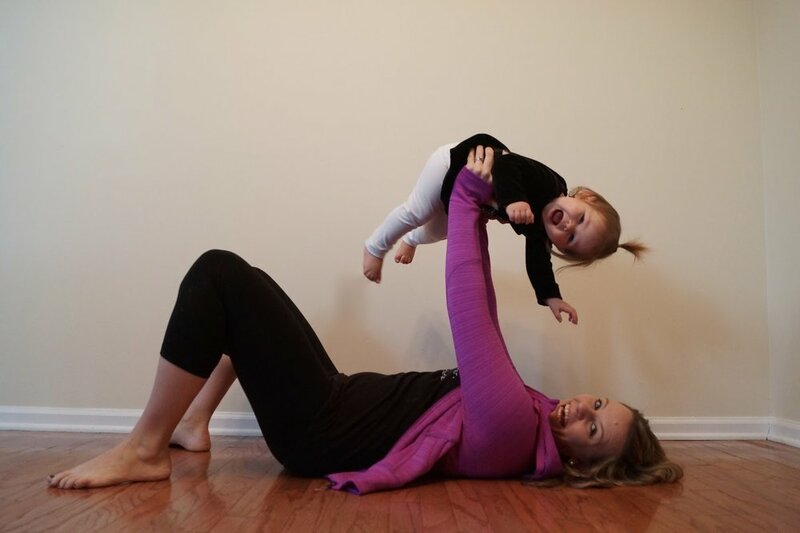 Start with a few exercises to promote muscular activation of your pelvic floor and the surrounding muscles, which have been under a lot of stress supporting your little one for the past 40 weeks. Ideally you’ve been doing Kegels for months, but if you’ve fallen off the train below is a refresher. Another great exercise to incorporate in order to start gradually strengthening your abdominal muscles is the pelvic tilt. Don't forget to keep breathing. Another form of exercise, often overlooked, is walking. As soon as you feel up to it, start slowly walking around the neighborhood with your bundle of joy in a stroller/carrier. Start with 10-15 minutes and gradually increase. If you’re sore or very fatigued the next day, scale back a little bit for your next walk. 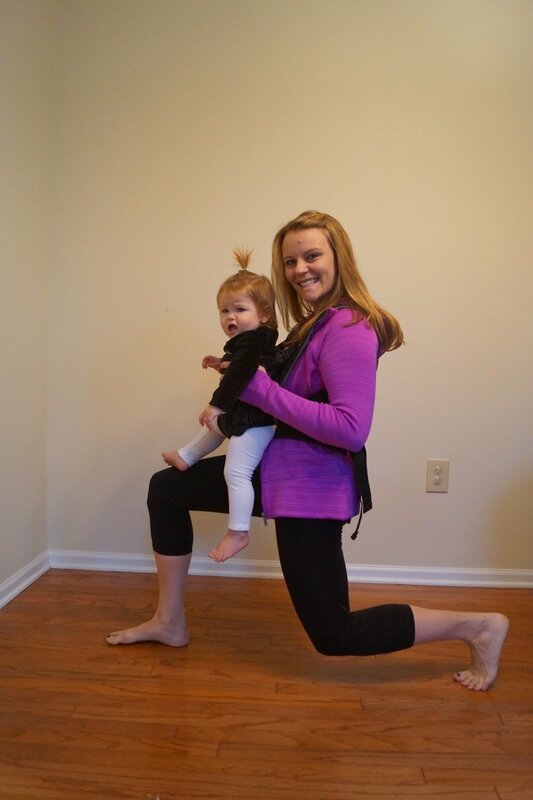 Some great strengthening exercises to start incorporating can easily be done using your baby as added weight. As you get stronger, your resistance gradually increases as baby grows! Most doctors recommend waiting until 6 weeks after a vaginal delivery to start exercise, make sure you check with your own physician. Also, don’t lift your baby away from you until he or she has good head control, generally around 3-4 months. One of the best core stabilization exercises for you! Start on either on your forearms or up on your hands, elbows straight but not locked. Warning - when your baby is mobile, you may turn into a bridge or you might be lucky enough to get kisses to distract you from your plank! Additionally, there are exercise groups you can join, specifically for moms and their little ones. Many groups offer classes such as stroller walking at the local park or mall, depending on the weather, or yoga where both you and baby are welcome! Please keep in mind that these are general guidelines for an uncomplicated pregnancy with vaginal delivery. If you underwent a c-section, many physicians suggest waiting until 8 weeks to begin exercising. Make sure you communicate with you doctor in order to do what is best for you!